Vacation is a system which counts the number of vacation days. The number of vacations days depends on age and the number of working years. Number of working years – the sum of all working years of all employers. Model design starts from attribute that indicates all system. In this case it is attribute VacationDays. On the level 1 it is finalized into three physical attributes age, service, days. In the following division is made and the relation between attributes is showed. Level 3 is the last level of ARD diagrams. 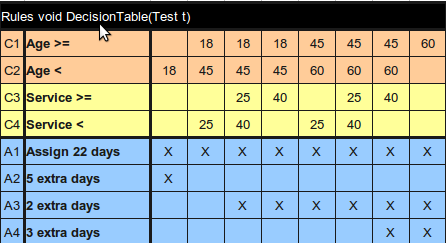 The system which counts vacation days was designed in one XTT table.